Why Air Switch rather than Electrical Wall Switch? 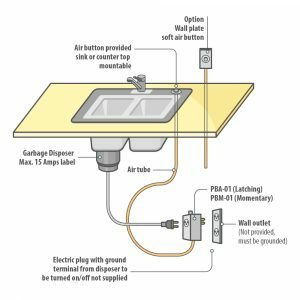 A garbage disposal air switch activates your disposal by pressing a button, which sends a pulse of air through PVC tubing to a control box underneath your sink which contains an air pressure switch. The disposal air switch is compatible with most garbage disposals and installation is easy! For installation instructions, view the PDF below. The air switches do not rely on electricity therefore they can be mounted on the counter or sink surfaces. The mounting style allows easy access compared to the traditional wall switch. The wall switch is best mounted off the surface area of a counter or sink (to avoid the wet environment), which can make them an inconvenience. If the switch were installed near the sink, exposure to water and other liquid, with the potential of a shock hazard! Using a disposal air switch you remove the risk of electrical shock because there is no current at the point of actuation. The garbage disposal air switch is a great solution for island sink installations. Unfortunately the garbage disposal air switch is less common than other options due to the higher price. Buttons can be purchased individually or you can purchase the complete assembly to activate your garbage disposal safely. The buttons are available in a number of different finishes to match your kitchen decor. Although, take into consideration when cleaning near the area that harsh chemicals are not being used as it could potentially damage the button’s finish. To be safe, go with a more resistant surface. For more information about Presair’s garbage disposal air switch, visit our online store or contact us!